Posted By Carlos On June 7th 2017. Under Annotated Bibliography Tips Tags: annotated bibliography psychology, psychology annotated bibliography, psychology bibliography . Some of you could have handled a psychology annotated bibliography before but maybe they had no idea exactly what they were dealing with. This type of format for a bibliography is quite unique since it deals with a lot more than what a basic bibliography deals with. An annotated bibliography basically contains comments made by the author of the published work concerning the scope, usefulness or other features of the works listed. With annotated bibliography psychology comes into play since you will be expected to make additional comments beyond the normal referencing. In most cases it appears at the end of a report, book or essay. It makes a listing of works cited in the text. When dealing with particular areas of study especially sciences make sure that you refer to the most recent sources. This is because they are regular changes and revisions that occur when new theories and findings, which often supersede older ones, are published. In brief outline the writer’s background. The level of expertise, as well as a respect to the topic, should be determined. You should describe how the author arrived at their conclusions. This entails the method they used as well as the basis of the arguments and the decisions made. This involves explaining exactly how the source is relevant to the assignment or topic at hand. This should answer the question whether the source redirects the question or whether it adds to the conclusions. You should follow the citation style guidelines according to the citation style you have been asked to adopt. There are many citation styles yet all of them conform to the order of listing sources alphabetically by each author’s last name. You should provide a short outline of the topic covered by your source. This is crucial since it gives a rough idea of what is communicated by the bibliography. Identify the author’s position as well as central argument and in case there are any perceived biases do not forget to mention them. You should also provide an explanation how the cited works illuminate your bibliography topic. Evaluate some strong and weak points in the thesis, arguments raised up as well as the method used. It is advisable to indicate why the source used as a reference is considered good and credible. Indicate what has been left out by that particular source. Compare your work with another that you have cited. You could comment of the nature of the intended audience and how the bibliography impacts on them. Click here and take a look on this good literature review sample. Our experts have worked on psychology annotated bibliographies over many years so you can trust them to come up with credible advice. Make sure that you indent all your text and this will include the write-up beneath the citation and the significance of this is so that the author’s last name is the only text that is flush left. 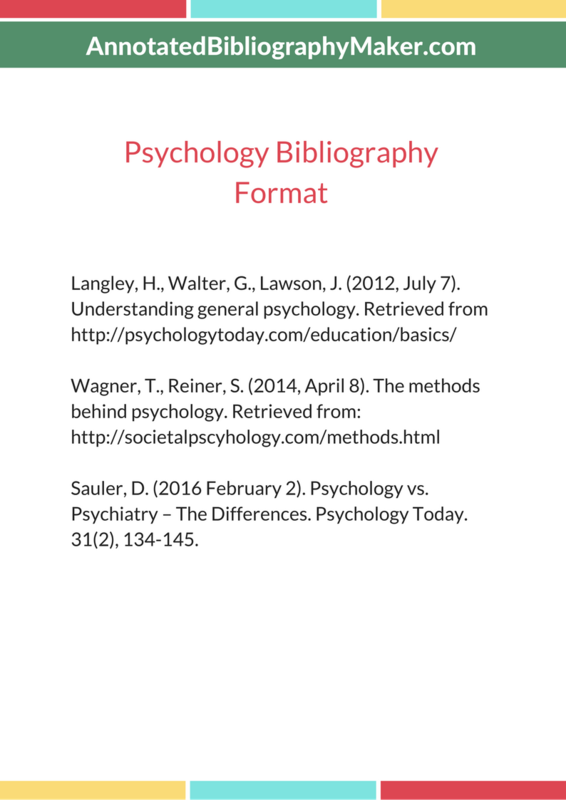 According to the experts, it is advisable to know what this particular type of psychology bibliography is and then write it in the right format for conformity purposes. If you still in doubts on how to make this bibliography, feel free to ask our professionals for help 24/7. With annotated bibliography psychology is brought into play since personal remarks and comments are involved. You can contact our team for assistance with your psychology bibliography. We are quite fast and efficient and we get back to you within a few seconds of getting to us. Our content dependable since it has been revised and proofreaded, it is original and of very high quality and there are zero cases of plagiarism that will come up. Avail our brilliant experts today if you need 100% reliable help with your psychology annotated bibliography! This is excellent and just what I need. Thank you. It is likely I will use your services again.